A new online game from Mayo Clinic's Education Innovation Lab is setting out to help clinicians improve their critical-thinking and decision-making skill. 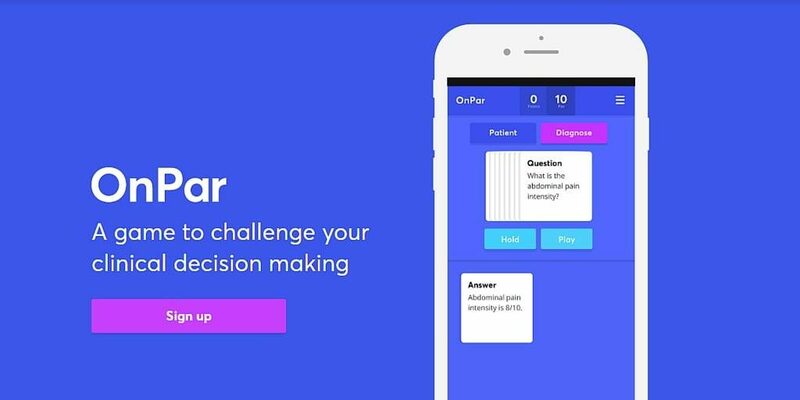 OnPar, a clinical decision-making game, challenges clinicians to diagnose real life patient cases in an innovative and engaging new format that’s much like the game of golf. This game was developed by a new product development team called Mayo Education Innovation. This team has been given the charge to shake up and lead the field in terms of how continuing professional education is accomplished. For several months, the Mayo Education Innovation product development team has been testing out how an innovation lab would work using the same methods that create successful startup companies. This lean startup methodology focuses on rapid learning, building, testing, succeeding and, when necessary, failing. OnPar, one of the prototypes developed using the methodology, presents clinicians with their choice of patient cases and asks them to solve each case in as few “strokes” as possible. Once a case is selected, each clinician is shown a deck of cards that have a series of case-related questions. The high-level elements of the case -- the patient's original complaint, their vitals, etc. -- can also be seen on-screen along with the predetermined par for that case -- or the number of cards that an expert clinician would typically need to play before diagnosing the patient.